The private foundation (PF) is an oversold commodity in this country. There are far too many of them with critical mass too small to meaningfully engage in the highest and best use of a PF, namely, the business of philanthropy. In my humble opinion, the business of philanthropy requires real money and because of this, foundations with less than a couple of million dollars in their coffers have limited usefulness. Of course, it depends upon how we define the “business of philanthropy” but with PF’s required to pay out only 5% of assets in any given year, small PF’s that are not self-liquidating are truly constrained from acting as anything other than a charitable pocketbook. Nevertheless, many successful people dream about establishing their own PF. Some have true aspirations in the business of philanthropy while others are enamored with the idea of their family name adorning such a charitable vehicle. The majority, however, probably have little idea about what it all means and how far they want to take it. Might a different format for charitable giving make more sense? Looking at it a different way, if you were starting a business, wouldn’t you first develop a business plan? 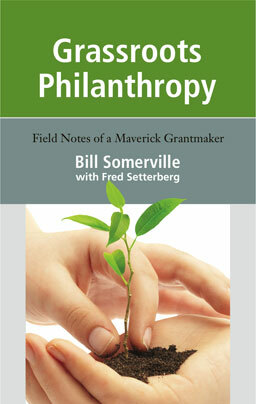 If you want to enter the business of philanthropy, shouldn’t the same assumption hold? Locating outstanding people doing important work. Moving quickly (and shedding paper). Focusing on ideas instead of problems. Sounds like a variation of the plain, old blueprint for entrepreneurial success, doesn’t it? And, if it were actually so easy, wouldn’t everyone do it? In addition to all of this, Somerville feels that the average foundation executive should get out of his/her comfortable office (read: comfort zone) and into the field far more often than s/he does. (He suggests getting out and about a minimum of 30% of the time.) In this way the executive can see firsthand the good works that are being done (or not) by the organizations funded, and not merely rely on the mound of paperwork that accompanies grant solicitations and follow-up reports. Somerville relayed a story about the time when his organization wanted to fund some programs benefiting the homeless in San Francisco. Somerville arranged to spend a night on the streets with the folks running the programs so that he could actually meet the clients of the programs. This event affected him deeply, putting a human face on the problem of homelessness that informs his approach to this issue to this very day. Not many funders would go this far, but perhaps they should. So, the lesson for those who want to move “from success to significance” by starting their own private foundations and engaging in the business of philanthropy is also simple to state but hard to implement – Are you truly willing to get your hands dirty within your chosen area of philanthropy? Are you willing to act like the social entrepreneur you need to be if you want to make a difference in the world? (Think Bill and Melinda Gates, but perhaps with a few less zeros at the end of your foundation’s value.) You have to get to know the true movers and shakers in the not-for-profit world who are doing the actual business of (fill-in the blank: housing the homeless, feeding the hungry, rescuing dogs and cats, underwriting aspiring artists, etc.…). You need to see what is actually going on out there and develop reasonable metrics tempered by the human element that is implicit in philanthropy. You need to eschew paperwork and PowerPoint presentations for touting potential and measuring success and go out there and see for yourself. You need to realize that the reward for good philanthropic work lies not in the celebratory black tie dinners but in seeing the results of on-the-ground agencies achieving success in their areas of expertise. If such a scenario excites you, and you have the funds to make such a worthy investment, then you may be ready for that private foundation – and an “Act II” that will truly bring you from success to significance.